This 2 minute video is worth every second. Stephen Moore: "People want insurance for their own families, not for other people's families." THAT'S NOT HOW INSURANCE WORKS. As we all know students tend to suffer a massive though usually temporary memory loss over the weekend related to classroom procedures, rules, and generally how to act in school :) Throw in what they've forgotten about the recipe you're working on, and it's utter chaos. You have enough to do over the weekend without piling on school grocery shopping. Amiright? This buys you one more day to do laundry if you're behind on the towels. Nothing worse than not having enough clean towels. After the first few weeks, there's always one day of the week when you won't be asked "Are we cooking today?" (as if there are ever, ever surprise cooking days). On the occasions when students forget what day it is and ask, the other students are usually all to happy to answer the question for you - no, it's the first day of the week! Anyone else share this rule? Do you have others about when labs are scheduled? Came across this tweet and thought it would be a great artifact for any kind of family studies course. Sharing here for your enjoyment and possible practical use! Thought I'd re-post a few past entries about end of year activities for the newbies to the blog who haven't been through the archives. Here's one from FIVE years ago - how is that possible?? During what month of pregnancy is it safe for a pregnant woman to drink alcohol? Who was the first explorer to circumnavigate the globe? Name any two parts of a plant. What is the date of St. Patrick's Day? How many bones do you have once you reach adulthood? In which ocean is Hawaii? Where did each of the four planes crash on 9/11? What are the first three digits of Pi? Once they realize what kind of a quiz it is and stop moaning they really get into it. When everyone is finished, we then go over the answers. Some of the scores are pretty frightening. The kids tend to really enjoy this, and we wind up with great discussions about what they've learned, what they wish they learned, and what they think they will use the most in post-high school life. Typically this uses the entire hour, but if there's time leftover I have them try to write down as many of the US states as they can remember. Also a little frightening. It's a great way to use one of those post-grades/pre-graduation days. Hi everyone! I'm slowly working my way through backlogged emails, sorry if you've been waiting for a response from me. Hopefully I'm back in business now. 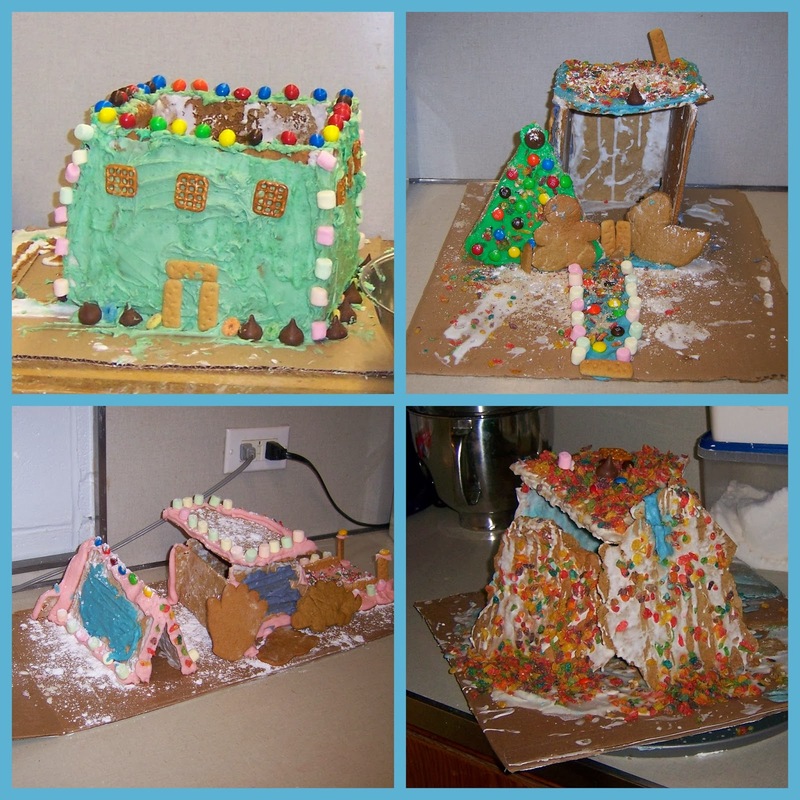 Here's a throwback post describing a fun end-of-the-(calendar)year project, gingerbread houses! Enjoy! Second quarter of my Foods I class is dedicated exclusively to baking, and the culminating project I like to finish out with is the creation of gingerbread houses. This was my sixth year implementing this lab, and I think that I've almost got it down pat - close enough to share, anyway. So, here we go! Each cooking group creates a gingerbread house (or another imaginative structure that will fit within the given dimensions for the project). Completed gingerbread houses are displayed at the district Christmas get-together (an after school event), where ballots are available for all faculty and staff to vote for their favorite. 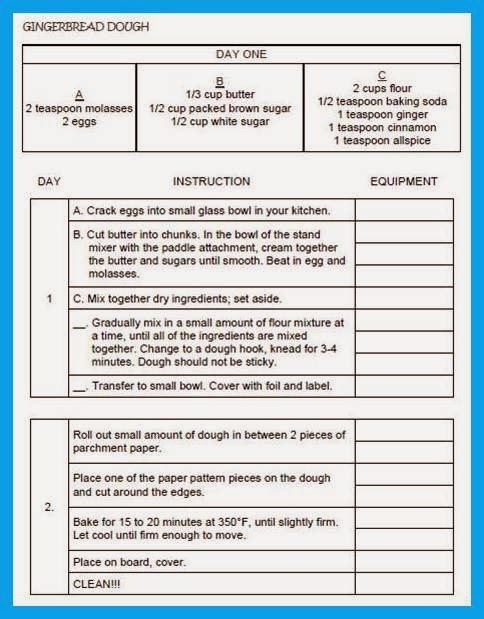 Dec 10th - Make the gingerbread dough. Chill over night. Dec 11th - Cut out and bake pieces. Dec 12th - Make the icing. Glue pieces together. Let dry over night. Dec 13th - Begin decorating. Dec 16th - Finish decorating. Dec 17th - Super clean the kitchens. Learning Experience #1: The first couple of years I did this, I tried to go too fast. I wanted them to bake and make icing the same day; only gave one day for decorating; my first year I think I even tried to have them glue and decorate on the same day. Crazy. GO SLOW TO GO FAST! LE #2: Leave at least one if not two class periods in between when you plan to end the lab and the day of the presentation. The first year I timed this so that they would finish the last day of the semester before Christmas Break. Yup, wound up being a snow day. Crap. Also, allow time for REALLY GOOD CLEANING. The icing can be really hard to see and gets everywhere, so they will need to re-clean the kitchens at least once after their final preparation day. This recipe will actually make enough dough for nearly two houses of the size I have the kids make. It's a good amount, because a) you'll have extra dough handy in case disaster strikes, b) kids can make little extras to decorate their houses with, and c) it's still a small enough amount that it will all fit in a cereal bowl, so will not take up astronomical amounts of room in the fridge. LE #3: My first year I wanted to make sure they had enough dough for do-overs and such, and had them make a recipe that was twice this much. Big mistake! This is more than enough! Note: It's fairly likely that the shapes will not finish baking by the end of the period, unless you are on a block schedule or have super efficient kids. This isn't a terrible nuisance; since these won't be eaten, you don't need to worry about keeping them fresh. In fact, once both classes finished baking and the ovens cooled, I just put all of the cookie sheets back in the ovens overnight. If this won't work with your schedule, consider adding another day to the timeline: roll/cut and bake on separate days. 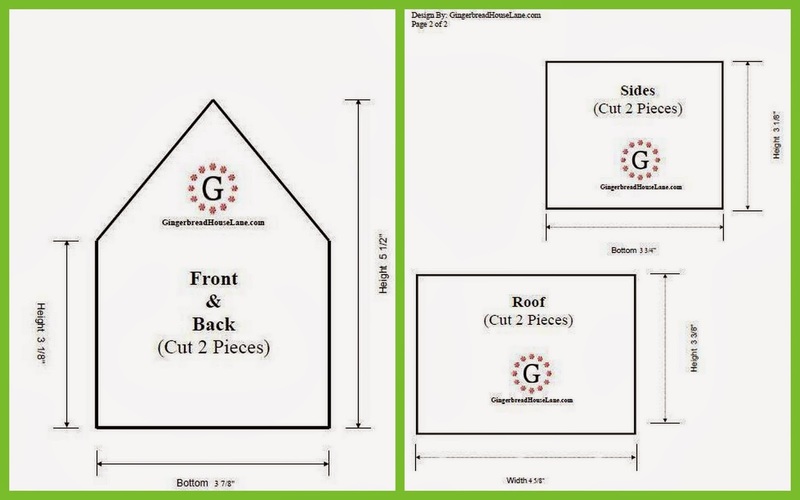 The pattern I use comes from the website Gingerbread House Lane. If you follow the link, you can download a free PDF. I created this short video to demonstrate rolling out and cutting the dough pieces - I show it in class right before it is their turn to roll out and cut. LE #4: Again my first year, I let the groups design their own house and make it as big as they wanted as long as it fit on the board I gave them. Oh, youth! This turned out to be a just plain stupid idea. I do give them the option of altering the pattern or getting other ideas approved, but they cannot exceed the dimensions of the above. The photo of the first year houses below portrays the ugliness but (thankfully) hides most of the insane mess created! LE #5: Due to storage issues, next year I will slightly reduce the size of the pattern from above. The explanation is in the next section. Obviously you're going to need a reliable place to store these while in progress, as they're going to be around for a week and you don't want to attract critters. In the past I've only had one class at a time doing these, so once I reduced the dimensions after the first year (seriously, what was I thinking?) storage was pretty easy: I simply kept them in the ovens and/or microwaves. Worked like a charm. This year I had two classes making them, so that wasn't going to work. I realized that they would fit in cake carriers - brilliant! 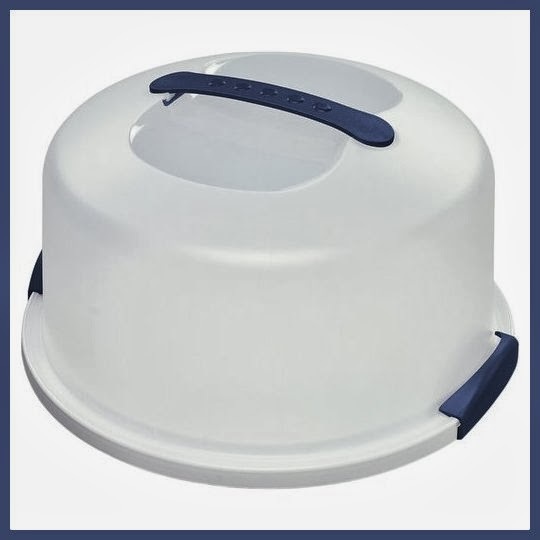 Airtight and easily portable! A few weeks before beginning this project, I started asking my kids to check if they had one of these at home and if they could get permission to bring it in. Several kids came back saying they could bring one. Perfect! LE #6: Two kids actually followed through and brought them in. Sensing this impending disaster, I sent out a plea to my co-workers. Three came through for me on such short notice, which was really awesome. Next year, I will ask the staff for loaners earlier, and possibly purchase some for the classroom. They're only $5-$6 at WalMart, after all. LE #7: Oh, brilliant plans gone awry! The assembled houses fit PERFECTLY in these. Until the kids put rows of Hershey's kisses or gumdrops along the top of the roof. Hence, next year I will slightly reduce the pattern to allow clearance for roof decorations. For the icing, I use the Wilton royal icing recipe with meringue powder. It works extremely well and does not involve separating egg whites! LE #8: Cut this recipe in half to start. Several groups will only need one batch. For those who need more, after they've made it once the second time they can put it together really quickly. I use Wilton disposable decorating bags; these work fabulously, and you get 100 for $15. No need to invest in anything fancy. LE #9: The first year I refrigerated the icing. This turned out to be an enormous pain, because of course it hardened and needed to be thinned out and all in all was a terrible idea. I now seal the individual pastry bags in gallon-sized freezer bags and toss them in a box with a lid for the next day(s). LE #10: I used to give them decorating tips to use with the bags. This was a big ol' mess. Unless you've got a more advanced class or you have taught them to use these ahead of time, you will also wind up with a big ol' mess. They can fancy it up with other decorations. Just have them clip the points of the plastic bags and go. Untested tip: One of the ladies that lent me a cake carrier said that she melts marshmallow fluff to use for "snow." She says it creates the perfect effect and will harden just like icing. Gotta try this one out! LE #11: Be prepared for meltdowns on gluing day, both physically from a house or two and emotionally across the room. Keep a special eye on your perfectionists and the students who are used to being good at everything; this is challenging and at least a couple kids will get pretty upset. Before beginning this step I show them photo examples of houses that have "gone wrong" in the past and how those students came up with creative solutions (for such an example, see "The Bowl" below). Typically, there are three items I buy for the decorating, all of them generic brand cereals in the really big bags: generic "Golden Grahams," generic "Fruit Loops," and generic "Fruity Pebbles." Those three bags provided enough decor for nine groups this year, and I had about half of each leftover for next year. I tell the kids in advance what I'm going to provide, and tell them that they are allowed to bring in any non-perishable items that they would like to add. Usually they wind up bringing in quite a bit of stuff, and surprisingly they're almost always really good about sharing with other groups - even when the other groups have nothing to "exchange." So nice to see kids being nice to each other! On the first day of decorating, I provide a limited number of cookie cutters for the kids to bake shapes out of their leftover dough (gingerbread men/women, Christmas trees, stars, that kind of thing). LE #12: If ever you have letter cookie cutters out for some reason, explain the expectation that nothing inappropriate should be spelled out with them, and never leave the cutters unattended. My second year of teaching I left a pile of letter cookie cutters on a table when I left for lunch duty (my classroom door didn't close due to the fire escape in the room). When I returned I found some really nasty words spelled out on my table. Super. Luckily they weren't viewed by the wrong eyes before I could destroy them. Morons. Each group needs to come up with a title for their house, and produce a short story introducing it (just a paragraph will do, nothing extravagant). This will be part of the final display. I also take a picture of each group holding their gingerbread house. I then make a page for each house with a border, their photo, their title, and their story. LE #13: While it would of course be better to have them do this themselves, computer lab time is EXTREMELY limited during this time period. Next year I will sign up extra early, and create a template for them to use to make their own display signs. That way they do the actual work, but all of the signs have a uniform look. I purchased two cheap Christmas-y tablecloths to cover the tables in the library that I used for the displays. A few students helped me set the houses around the tables, and their story pages in front of the houses. For the ballots, I simply printed out slips of paper with the titles of the houses, and asked the adults to circle their favorite, based on whatever criteria they chose. I set out a green tin and a red tin - one filled with red and green colored pencils to fill out the ballots, and one to hold completed ballots. To make sure this idea caught on, I folded up a blank ballot and put it in the empty tin, so that others would know what to do. LE #14: Next year I am going to create categories to vote for: best construction, best story, most creative, etc. Next year they'll all be displayed on round cake carrier bases! As I mentioned before, I had quite a bit of the Malt-o-Meal decorations left over, so I put them away for next year. First they went into Rubbermaid containers. I also put leftover decorations that the students brought in and donated (mostly because they didn't feel like taking them back home) in Ziploc baggies. All of the sealed decorations along with the tablecloths went into a copy paper box ( I LOVE copy paper boxes!) lined with a heavy duty trash bag (notice the many layers of defense to protect against attracting unwanted critters!). I labeled the box, and put it with its other box friends. All ready to go for next year! LE #15: When reusing supplies from the previous year, be sure to unpack the box in front of the kids so that they know you're serious when you tell them that the decorations are a year old and they shouldn't taste test them. Soooo many kids learned to believe me the hard way. It really won't hurt them to eat year-old Frankenfood, but it will be quite stale and disgusting-tasting. And a couple of them will probably act like they're dying, drama queens. And finally, here are the nine gingerbread houses and accompanying stories from this year's classes! Aren't they wonderful? This is a big, time-consuming project that takes a considerable amount of work, organization, and tight adherence to cleaning rules. BUT, the kids (girls and boys alike) are always highly enthusiastic and work really hard on them. The staff (and school board members, ahem) really enjoy the display at the party, so it is a good PR bump for your program. In the end it's pretty awesome to see their creativity at work. And, it's a terrific way to end the term right before the holidays. For me, it's a keeper! One of my objectives in Child Development is to get my students to realize that early childhood is not always the blissful, easy experience that they now remember it as - childhood is hard work! To address this, I pepper the semester with various activities to help them develop empathy for their younger selves. One method is to make them complete "simple" tasks with their non-dominant hands, like coloring. They get so excited when I pull out coloring pages and crayons, until they find out they have to use their "other" hands (by the way, I'm very careful to determine everyone's dominant hand well before any of these activities, so I won't have any cheaters). From coloring I move on to more difficult tasks, such as creating a paper plate turkey! This involves not only coloring, but also cutting, gluing, and stapling. Fun, but very difficult to do with your opposite hand. To make the project go smoother, I assemble their supplies beforehand (yep, there are those formula cans and copy paper box lids again!). In the cans (which double as their personal trash cans while working on this project) I place a little baggie of crayons, a glue stick, and safety scissors. Then in gallon-sized Ziploc bags, I place 2 paper plates, a small square of yellow construction paper, a small square of red construction paper, and two googly eyes. Then the cans and the baggies are placed in box lids, making them easy to store until I need them, and easy to pass out when we begin. For the instructions, I play the video demonstration I created. This frees me up to help frustrated students - and also to catch the cheaters who are using their dominant hands! When we are finished, I have a volunteer walk the big trash can around so students can empty their mini trash cans. 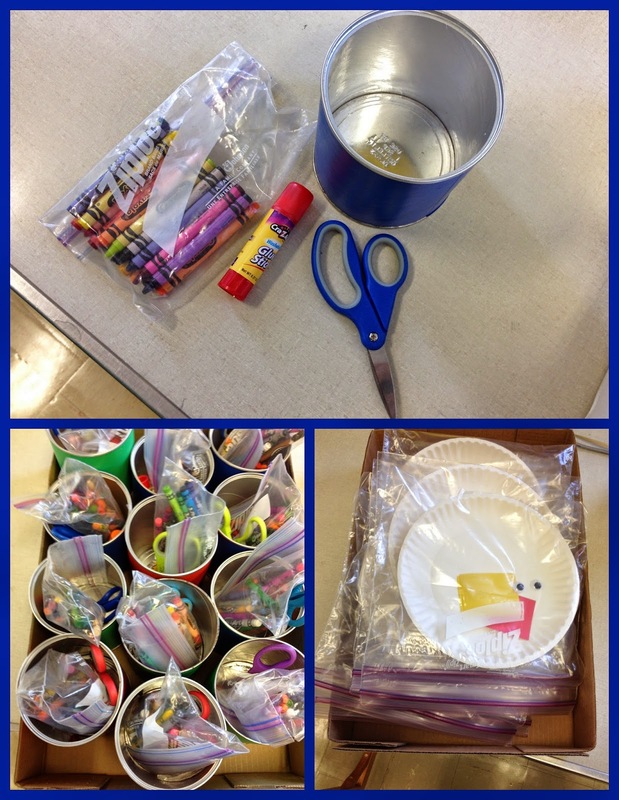 Then someone else collects the now empty baggies, and a third student collects the cans with the scissors, glue stick, and crayons. Having only three students taking care of trash and collecting supplies is WAY LESS chaotic than having twenty-something high schoolers running around returning items. And of course, there is also written component to the project, in which among other things students need to describe the physical, intellectual, social, and emotional benefits a child would experience from this activity. Feel free to use any and all of these resources! To Continue the Thanksgiving Theme... Thank YOU! 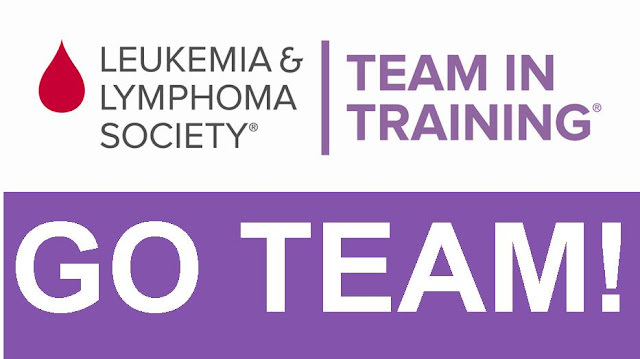 A big, heartfelt thank you to all of those who have donated to the Leukemia & Lymphoma Society through my FACS fundraiser over the past year and a half! This year's donors live all across the country - take a look! It's been a really tough month, and I know an awful lot of us are worried about the future and where our country is headed, but this just goes to show that people who care and work together CAN make a difference! Thank you for being a part of my small group of thoughtful, committed citizens working to change the world!